We were unable to reach a contract agreement with the camp for 2015; and it is unlikely we will, any time in the foreseeable future. The entire PSSP Staff extends a heartfelt thank you to all of our loyal attendees and supporters; for all of the good times and great memories. This website is no longer maintained on a regular basis. We have archived this website to keep it available for historical and reference purposes. It is, for the most part, as it was when Prairie Skies ended. Over time, links may become outdated and broken. We can still be contacted at the phone number at the bottom of each page. 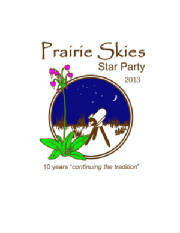 Prairie Skies Star Party is held at beautiful Camp Shaw-Waw-Nas-See 4-H camp, near Bourbonnais IL. As anyone who has been to Camp Shaw knows, its rustic character and natural setting provide a warm and friendly atmosphere for a star party. We invite you to join us as we "continue the tradition" ! 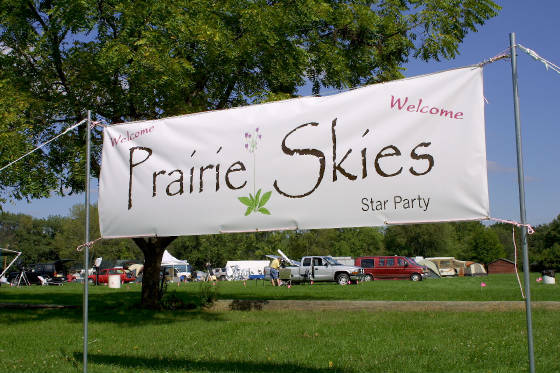 Prairie Skies 10th Anniversary coffee mugs and hats are still available over at Zazzle! The mug features a full color version of 2013's shirt design (the shirts were only 4 colors). and while you're here, ......... Listen To Some GREAT Internet Radio ! Check out our UPDATES! page for the latest news! If you submit your e-mail address and DO NOT receive a confirmation reply, assume your submission WAS NOT received! Try again or contact us by phone. 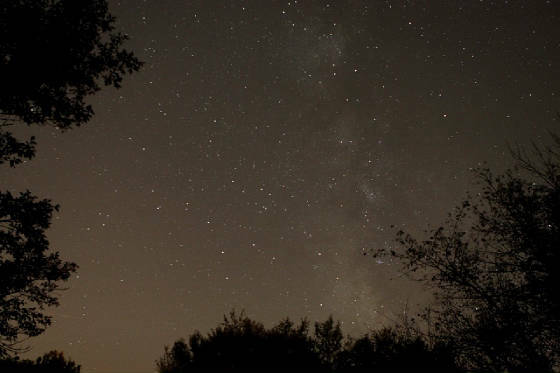 Looking for a springtime star party? Are you into Star Trek? 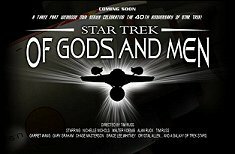 Check out these fan based productions! © Prairie Skies Astronomical Association. All rights reserved.